Boris Johnson launched his transport polices in a hall next to St Pancras station today. Theresa Villiers MP, Shadow Minister for Transport, also spoke and the event was chaired by Bexley Council leader Ian Clement. The pledge for extra police for Tube and railway stations makes the frontpage headline in the Evening Standard, which has been running a Safer Stations campaign. By focusing on making traffic flow more smoothly through measures like re-phasing traffic lights, allowing motorcycles in bus lanes and cracking down on utility companies who dig up the roads. By re-instating the tidal flow at the Blackwall tunnel and opposing toll charge increases at the Dartford crossing. By improving public transport in outer London through orbital bus routes and campaigning for better rail services. By spending less on press officers and more on police officers to patrol the network – increasing their presence on buses and station platforms in outer London. By introducing ‘Payback London’, a scheme that will require under-18s who abuse their right to free bus travel to earn it back through community service. By cracking down on illegal minicabs. By supporting different forms of transport like river services, and renewing traditional forms by commissioning a 21st-century Routemaster with conductors. By making London a truly cycle-friendly city through increasing secure cycle parking and introducing a bike-hire scheme. By improving the daily commuter experience through better information, and extending the Oyster top-up network. By halting the proposed Tube ticket office closures and ensuring there is always a manned ticket office at every station. "It is time to get tough with the militants running riot on the Tube. Ken Livingstone may talk tough, but as the ultimate boss of the Underground through Transport for London he has bowed to their outrageous demands too many times. Londoners are paying the price for his weakness in higher fares. Livingstone even put his one-time comrade Bob Crow, general secretary of the RMT, on the board of TfL. As Mayor, I would campaign for a change in the law to make illegal strikes in essential public services such as the Tube and the fire and ambulance services. Londoners need better protection and better services." In the eventuality of another public transport strike Borwick believes a contingency plan should include free parking in London parks and a temporary suspension of the congestion charge. Phil Taylor: Why is London's public transport so broken? Phil Taylor is an Ealing councillor and runs one of ConservativeHome's favourite blogs. At the end of July Transport for London's (TfL’s) Annual Report and Accounts was published without fanfare on the their website. TfL was formed, along with the GLA and the London Mayor, by the 1999 GLA Act and is in charge of all public transport in London except for mainline rail services. In July 2003 London Underground, the Tube, became a part of TfL. TfL's 2003 figures were restated to include the Tube so we now have 5 years worth of comparable figures to pore over, an audit trail that makes it increasingly hard for the Mayor to hide the bodies. In this article I try to unearth them. The complaints about London's public transport are many and loud. It is way too expensive, the Tube is overcrowded and dilapidated, buses are vandalised with drivers who often don't drive well and are unable to control the behaviour of hordes of young people travelling for free and adults who refuse to pay. At the same time the system is massively subsidised. The scale of this subsidy is quite shocking. In the last five years London's public transport system has swallowed £12 billion of external support. The amount of subsidy that TfL has spent over the last five years is simply awesome. The main source of this funding is the Treasury, which provide both revenue and capital grants. There are some other minor sources of grants plus a small contribution from the GLA precept although the Mayor has been giving TfL less and less cash each year. It is only £12 million per annum now. The idea that chancellor Alistair Darling is going to keep sending this wave of money to London in the face of a tight Comprehensive Spending Review in 2008 is a little unlikely so a crunch will come unless Darling decides that London's votes are worth the price. The Mayor does not talk much about this subsidy but then he almost never talks about the cost of anything unless he is forced to. He talks about his historic 5 year funding deal with the Government and the extra buses he has bought and Tube renovation projects. But the idea that this subsidy is funding capital spending is largely a myth. Pretty much £8 billion of the £12 billion of subsidies have gone in supporting the running costs of TfL leaving only a third of the cash available for capital projects. 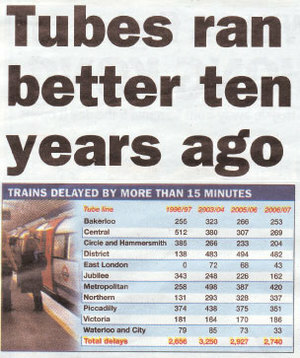 The Metro newspaper has reported that since 1997, delays on the London Underground have gotten worse. The figures reveal that during the same annual period ten years ago there were 2,656 delays lasting 15 minutes or more. today there were 2,740 train delays. This is despite the fact that Zone 1 ticket prices have risen from £1.20 ten years ago to £4 today. The TFL issued a response to the revelations stating that matters were ‘improving’ and it was investing more than £5 billion in the Underground network. Another issue for our Mayoral candidate to (eventually) sink their teeth into.